Plum Pretty Atkinson Dining Nook — Plum Pretty Decor and Design Plum Pretty Decor & Design Co.
For the Atkinson Dining nook I played on the colors and tones we used in the living room since the two areas are open to one another. I also incorporated like pieces from my dining nook design since you mentioned you loved the design. The settee makes for a great bench style seating without doing custom built ins. The chair cushions soften the look of the chairs and tie into the linen or the settee. The large jute rug helps define the space and is great at hiding messes. No need to worry about the little crumbs the kids drop and it vacuums great. I also continued the same curtain hardware and curtains that we used in the living room. This helps make the spaces flow. I know you mentioned you loved the three drying racks I have in my nook. I recreated the look with these distressed designed mirrors which will also reflect light and make the space appear bigger. For the center of the table I did a simple center piece that can easily be removed and placed back- I used a metal container and some simple greenery stems. I also included a new chandelier that will tie into the design. 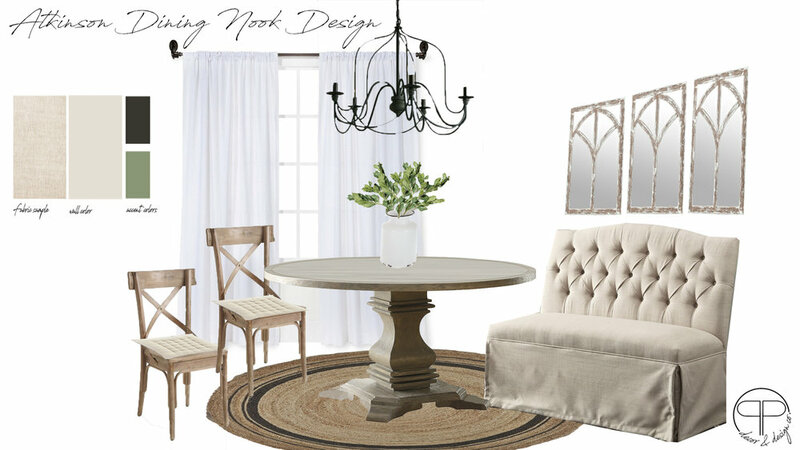 Above is the layout I designed for your dining nook with all the measurements included. In addition to the floor plan you want to center the mirrors in the all above the chair railed/settee which should be 16" above chair railing and 16" from ceiling. For the curtains you will hang them just like you did in the living room using the curtain clips (one pack per curtain panel). If you have any questions or comments on your dining nook design please enter them in the area below. I truly hope you love your newly designed dining nook!